Pioneers in the industry, we offer electronic anemometer, digital anemometer, air velocity meter, hand held anemometer, anemometer and vane anemometer from India. This sophisticated instrument is designed with totally indigenous technical know-how and components. It directly reads the rate of flow of air / gases, eliminating the need to import such instruments. Electronic Anemometer has several advantages over the mechanical type in common use, which is only a totalizer. To measure velocity, the Mechanical anemometer requires integration with respect to time. whereas the Electronic Anemometer, when placed in the air-flow to be measured, directly reads the air velocity in meters / second. The use of micro-circuits makes the Electronic Anemometer, remarkably compact and trouble free. They also permit the measurement of air-flow to an accuracy of +/- 2%. Besides the advanced electronics, the design incorporates many outstanding features. The sensing head consists of a chemically etched and dynamically balanced stainless steel turbine, which is pivoted on re-enforced jewel bearings, making it extremely sensitive to minute changes in the air- flow. Non-optical, non-magnetic, non-contact Transducer is insensitive to vibrations,dust,temperature,humidity, very high intensity magnetic fields. (AC or DC) and ultrasonic radiation. The Transducer uses the principle of Frequency Modulation and Slope Demodulation, resulting into the conversion of air-flow into electrical output. After suitable processing the output is read on the digital display. Optional facility for Air Temperature measurement can be incorporated in the same instrument. Air Velocity Transmitters (4-20 Ma 0/P) Air Velocity Monitors (Static Panel Type) And Air Velocity Switches Are Also Offered. Digital Anemometer has several advantages over the mechanical type in common use, which is only a totalizer. To measure velocity, the Mechanical anemometer requires integration with respect to time. whereas the Digital Anemometer, when placed in the air-flow to be measured, directly reads the air velocity in meters / second. The use of micro-circuits makes the Digital Anemometer, remarkably compact and trouble free. They also permit the measurement of air-flow to an accuracy of +/- 2%. Air Velocity Meter has several advantages over the mechanical type in common use, which is only a totalizer. To measure velocity, the Mechanical anemometer requires integration with respect to time. whereas the Air Velocity Meter, when placed in the air-flow to be measured, directly reads the air velocity in meters / second. The use of micro-circuits makes the Air Velocity Meter, remarkably compact and trouble free. They also permit the measurement of air-flow to an accuracy of +/- 2%. Hand Held Anemometer has several advantages over the mechanical type in common use, which is only a totalizer. To measure velocity, the Mechanical anemometer requires integration with respect to time. whereas the Hand Held Anemometer, when placed in the air-flow to be measured, directly reads the air velocity in meters / second. Anemometer has several advantages over the mechanical type in common use, which is only a totalizer. To measure velocity, the Mechanical anemometer requires integration with respect to time. whereas the Electronic Anemometer, when placed in the air-flow to be measured, directly reads the air velocity in meters / second. Vane Anemometer has several advantages over the mechanical type in common use, which is only a totalizer. To measure velocity, the Mechanical anemometer requires integration with respect to time. whereas the Vane Anemometer, when placed in the air-flow to be measured, directly reads the air velocity in meters / second. The use of micro-circuits makes the Vane Anemometer, remarkably compact and trouble free. They also permit the measurement of air-flow to an accuracy of +/- 2%. Portable Anemometer has several advantages over the mechanical type in common use, which is only a totalizer. To measure velocity, the Mechanical anemometer requires integration with respect to time. whereas the Portable Anemometer, when placed in the air-flow to be measured, directly reads the air velocity in meters / second. The use of micro-circuits makes the Portable Anemometer, remarkably compact and trouble free. They also permit the measurement of air-flow to an accuracy of +/- 2%. Anemometer Calibration has several advantages over the mechanical type in common use, which is only a totalizer. To measure velocity, the Mechanical anemometer requires integration with respect to time. whereas the Anemometer Calibration, when placed in the air-flow to be measured, directly reads the air velocity in meters / second. 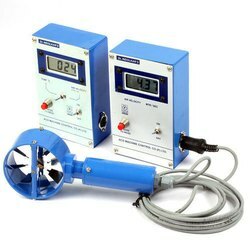 The use of micro-circuits makes the Anemometer Calibration, remarkably compact and trouble free. They also permit the measurement of air-flow to an accuracy of +/- 2%. 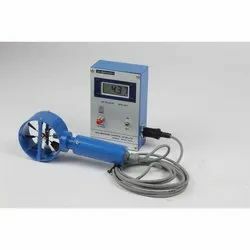 Air Velocity Meter Calibration has several advantages over the mechanical type in common use, which is only a totalizer. To measure velocity, the Mechanical anemometer requires integration with respect to time. whereas the Air Velocity Meter Calibration, when placed in the air-flow to be measured, directly reads the air velocity in meters / second. The use of micro-circuits makes the Air Velocity Meter Calibration, remarkably compact and trouble free. They also permit the measurement of air-flow to an accuracy of +/- 2%.